The underlying principle of all three technologies the same: specific production on the one side, a corresponding decoding arrangement plus additional speakers in the mix meaning that these elements of the soundtrack can no longer be viewed simply as a set-up or arrangement but rather as a precisely constructed dome enveloping the viewer more and more. This results in a better assimilation of the audience into the action, known as ‘Immersive sound’ meaning that the intensity of sensation while viewing is even more pronounced. However, since it’s known that many roads lead to Rome, it is not surprising that the developers of the formats pursue their own approaches to achieve this goal. These are often based on the concepts of “channel-based” and “object-based” distinction, although the distinctions are blurred in practice. For a better understanding of these issues, let’s break down the concepts. In a purely channel-based mixing all dialogue, sound effects and soundtrack are fixed for a certain number of channels – such as classical in 5.1 – mixed. All votes are then positioned, for example, in the centre, spreading the orchestra of normal stereo images and assigning specific items to the surround channels. While offering the possibility to convert such mixtures to other speaker AV set-ups has been around for a long time, here the only certain signal components from the original mixture are taken and distributed to the additional speakers. Primary information for each channel is not available in this case. This logic is reduces to a purely object-based mixture. Individual sounds, the so-called audio objects, rather than being positioned by certain assigned channel affiliations or movement instructions in the form of metadata that are independent of a specific speaker arrangement basically. When playing this metadata is then decoded in real time and it’s up to the AV receiver sounds on the actual speakers represent the best possible set-up. While Dolby emphasized, in the marketing of its caliber, the particular the potential of audio objects in contrast Auro Technologies have shown the full advantage of their channel-based approach. Ultimately in both cases are results of a hybrid method. 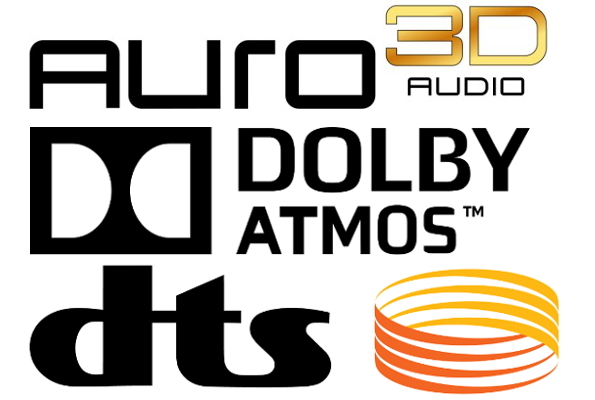 While Auro 3D basically supports the use of audio objects, Dolby Atmos always bases mixtures on a channel-based foundation (Engl. “bed”), which are scene-dependently enriched with audio objects. The principle of channel-based mixture to completely throw overboard would make little sense for several reasons. On the one hand is not any sound – think of wide, rather diffuse and atmospheric sounds – for use as an audio object, on the other hand, it is for example the case of individual instruments of a soundtrack not necessary to pose these as audio objects are available and then move through the space. These elements form the much more tonal framework in the then single dynamic audio objects are targeted and can act. Of the question of meaning aside the technical feasibility of a purely object-based film sound mix considering the amount of data to be processed is questionable. No wonder the number of maximum reproducible audio objects is limited, even for large Atmos systems for movie theaters upwards. Dolby recommends four speaker setup (5.1.2, 5.1.4, 7.1.2, 7.1.4) for the home theater market on the whole. The conventional 5.1-channel and 7.1-channel systems either two or four ceiling speakers, or so-called Dolby Atmos enabled speaker modules to be added. Furthermore, it requires a Dolby Atmos capable AV receiver to enjoy the 3D sound format. This decodes the additional information from the so-called core-extension structure of the two already established codecs TrueHD and Dolby Digital Plus. In this way, the backward compatibility is guaranteed. Not Dolby Atmos enabled devices ignore the data of the core extension structure simple and lead to the conventional multi-channel mix again. Auro Technologies track with the PCM-based Auro-3D Octopus codec a similar principle. The additional information will also be here in a conventional surround mix “hidden” and only play when an Auro 3D capable AV receiver decodes it. 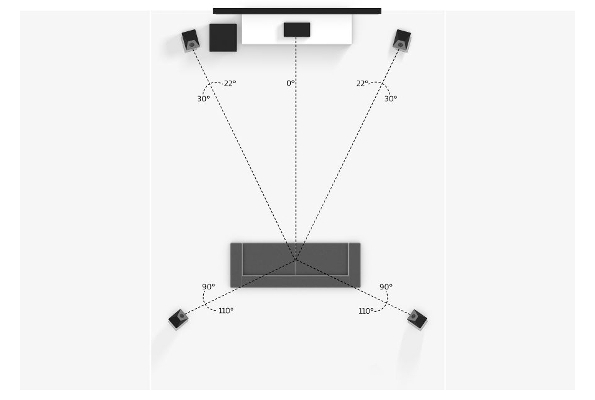 The recommended speaker setup is different from a typical Dolby Atmos installation in the sense that the additional speakers – from the optional voice-of-God Channel aside – each slightly angled (30 °) can be positioned directly over the four normal surround speakers and not directly shine down from the ceiling to the viewer. In Auro-talk is called the additional level of speakers Height layer. The nomenclature follows the Belgian Dolby competitors a different logic. Any additional channels are simply added together, so that (9.1 or 10.1 with the Voice-Of-God Channel) arising for home theater applications, in principle, two typical configurations. The frequently mentioned in connection with Auro 3D 11.1 Setup is rather interesting for cinema rooms. In order to sonicate the rear seats adequately, the center speaker also gets then a counterpart in the Height layer. Whether and how well the respective concepts of Auro Technologies and Dolby are compatible with each other in practice, will only have yet to emerge. Wilfried Van Baelen, one of the minds behind Auro 3D, observed last year in an interview without biting tone indicates that Dolby yes especially emphasize how tolerant Atmos against the speaker layout is and such a mixture therefore probably also very good on a Auro must work 9.1 installation. DTS:X is the availability of information currently still relatively thin. Once there are more details, we will of course late filing. The CES 2015 press release issued suggests definitely that even with DTS audio objects play an important role. The combination Selbiger with channel-based elements above mentioned reasons to accept also. Moreover, the past shows that DTS has oriented normally to the concepts of Dolby. A certain similarity between the loudspeaker layouts DTS and the recommendations of the competition thus seems likely, and also in terms of coding the additional sound information no experiments are to be expected. These are integrated in the known DTS-HD codec so here is provided for backward compatibility. DTS has also announced to want to make its technology available for the headphone and TV market. In the latter case, the viewer should be able to make a personalized mix for example in sports broadcasts from various audio objects (sound from the sidelines, comment, etc.). That this is technically feasible, the manufacturer demonstrated Whether such opportunities are actually used by the user in the context of CES 2015, however, is an entirely different question. Similar concepts have been conducted in the past, they could prevail, however, never. Moreover, it would be desirable to provide manufacturers would probably start in cooperation with producers and industry partners for a comprehensive support of new formats and especially the availability of content, rather than squinting directly to the development of new markets. Small steps in the right direction have already been taken here, but the road is still long. Whether Auro 3D will be able to go along this given the powerful competition to the end, remains to be seen, despite support from heavyweights Denon and Marantz. A certain degree of skepticism is certainly not unfounded. It would not be the first time that a technology has to surrender regardless of the actual quality before the established names in the industry. Great article, much more logic than most of what I have read. I believe that the hybrid approach would work for each of these systems, only if the use of dual VOG (Voice of God) channels were possible. Someone using a 16 channel processor like a Datasat RS20i could set the overhead VOG channel to used by two speakers instead of one and still have the 10.1 (with dual VOG) and keep the Atmos setup intact. 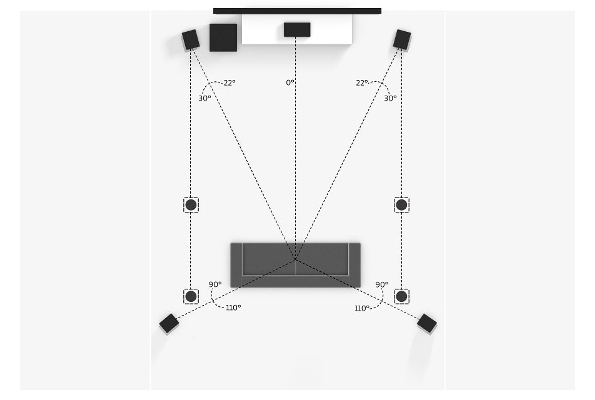 I hope this makes sense to you, I am saying that a 7.1 bed with 4 overhead speakers for Atmos; now we are at 11.1 total. 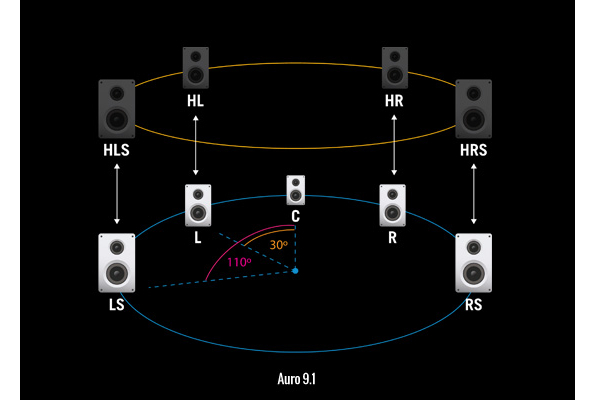 By adding the 4 height speakers (front height and surround height) for Auro3D and using 2 of the overhead speakers (set for dual mono) for the VOG; because they will only carry limited vocal anyway would keep both systems under a 16 channel limit and theoretically a hybrid system would be born that would supplement Atmos and Auro3D configurations at the same time. Well, that’s just a thought; Thank You for a very well written article. Hey Wayne, thank you very much for the kind words and adding your thoughts on this! The Datasat RS20i is a pretty elobrate approach though. 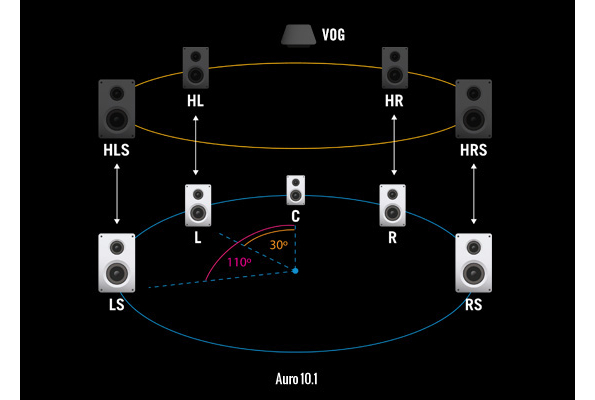 Do you think on an Auro 3D 11.1 setup the Voice of God channel should be best served by a centre speaker? Or do you thing a bookshelf speaker would be most suitable? Hi, in short: Both is possible. You could also use those flat speakers models like the Dali Fazon, KEF T-Series etc.